It is held in the province of Entre Ríos, Litoral region, where most of the Argentine summer festivities take place: Gualeguaychú carnival. It is very different from that in Buenos Aires and the murgas; Gualeguaychú will make you remember Río de Janeiro, the typical floats, the queens, the dancers dressed in sequins and feathers, and the nice and hot environment at the edge of the Uruguay River. A sambadrome for 40,000 spectators was built in 1997. The social and neighbor clubs that work all the year round for the choreography and apparels parade here on Saturdays in January, February and at the beginning of March. This carnival tradition dates back to the end of the 19th century but today samba groups such as Marí-Marí were formed in the 1970s, introducing the Brazilian rhythm bands and samba. They have 230 to 280 members and four floats. A theme is chosen each year and the parade starts with a couple of ambassadors who carry the flag with the colors of the samba group and a float. The beautiful costumes may weigh up to 80 kg and take up to 2,500 feathers. One of the floats carries the orchestra who has composed its own songs for the year, with samba music or inspired in African rhythm. The 30-percutionist rhythm band finishes the parade. A jury of personalities assesses the quality of each samba group: the music, the dance, the costumes, the floats, the setting-up. 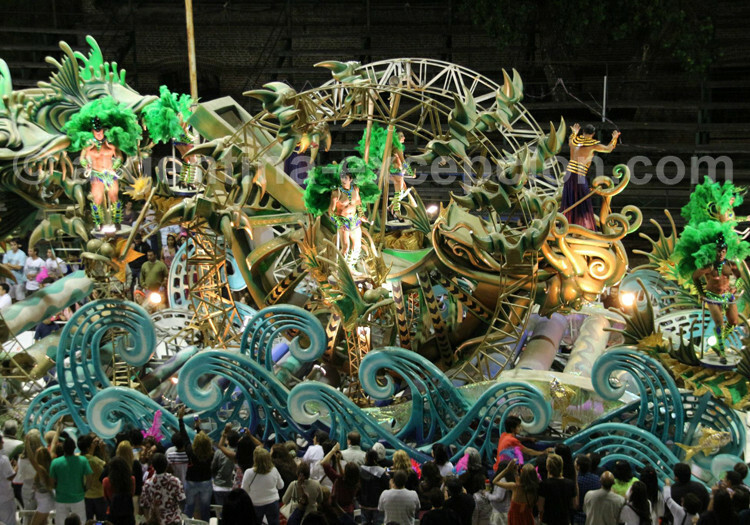 The themes are varied and characteristic of each samba group, for example: in 2008, Marí-Marí decided to retell the story and the conquests of Alexander Magnum, O’Bahía was interested in water and environment, and Ara Yeví in gastronomy. Thousands of people come to see this carnival, a colorful, magical and nice show, one of the most famous of the world. Argentina Excepción offers a week-end tour to live the Guelaguaychu carnival.